ICA | GemLab employs some of the most renowned exports in the gemological industry, ensuring each customer’s needs are handled with the utmost attention, care, and skill. Our team knows which methods or equipment to utilize in any given situation, no matter how specific or unusual, so that your gems are handled safely and the reports you receive are as detailed and accurate as possible. Our research manager and chief gemologist is a renowned colored-stone gemologist, lecturer, and leading authority on emeralds. 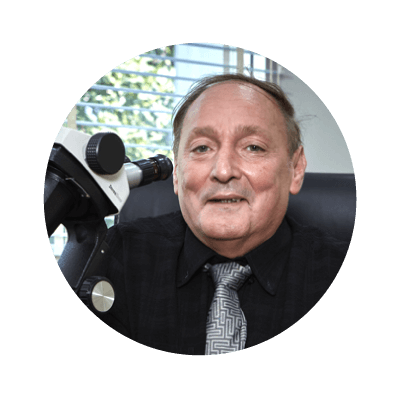 He served as the Head of Research at the Gubelin Laboratory in Switzerland for over two decades, and continues to lead gemstone workshops, seminars, and lectures internationally and in Thailand. His career in gemology spans four decades, including teaching and research on five different continents. He was a professor at the Universidade Federal de Ouro Preto in Minas Gerais, Brazil for more than seven years and the director at the Asian Institute of Gemological Sciences (AIGS) in Bangkok, Thailand for three years. He is currently serving as a part-time professor at Tongji University in Shanghai and a guest lecturer at the China University of Geosciences (Campus in Wuhan and Campus in Beijing). Dr. Schwarz has been involved in a great number of research projects. He is the author of the books “Esmeralda” (1987) and “Geographic Origin Determination of Colored Gemstones” (2012). In addition, he is a prolific author and co-author of numerous notable gemological research papers, most notably in the field of emeralds.